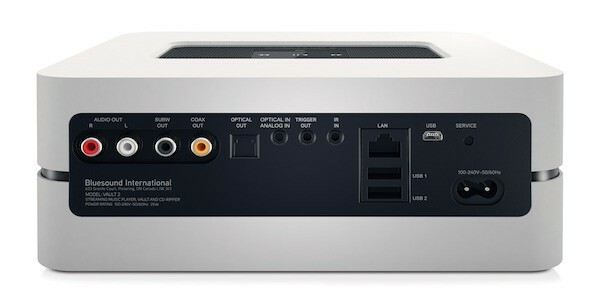 The Bluesound Node is a nifty piece of audio gear for streaming high-resolution audio to a stereo music system. When we first tested it last year, we loved its ease of use and decent audio quality. Now, the folks behind Bluesound – an alliance of audiophiles that includes hi-fi veteran NAD – have refreshed their entire portfolio with a less bulky design and better specs. Called Gen 2, the new portfolio comprises the Node 2, Powernode 2 and Vault 2. These so-called second-generation offerings are much slimmer, which means they can now fit into a hi-fi rack rather than sit on top of a TV console. Take the Node 2. Unlike the original Node, the 1.8-inches thick media streamer won’t look out of place in a living room. It also comes with a faster ARM Cortex A9 1GHz processor that should speed up indexing of music tracks from a network drive, as well as Bluetooth aptX support for streaming tunes from a smartphone or tablet. There’s also a new touch panel with volume and playback controls on top of the Node 2, so you don’t have to reach for the Bluesound app each time you want to skip tracks or lower the volume. What’s remains the same, however, is its DAC, which we understand is the same Cirrus Logic chip used in the first-gen Node. So Node owners looking for an upgrade in sound quality should hold their horses. Building on the qualities of the Powernode, the Powernode 2 media streamer with a built-in power amplifier now boosts of higher power output (60 watts) that should drive bigger speakers, a slimmer design like the Node 2 with touch controls, and an ARM Cortex A9 1GHz processor. During a media demo this week, the Powernode 2 was able to drive a pair of PSB Imagine floorstanding speakers with ease, though we’ll need to put this integrated stereo amp through its paces to determine its audio pedigree. The Vault 2 combines the same DAC and Cortex A9 processor common to all Node players, along with a noise-dampened 2TB hard drive and an optical drive for ripping tracks from CDs. And like the Node 2 and Powernode 2, you can also stream music from a network drive or online music services like Spotify, Deezer and Tidal. The Node 2, Powernode 2 and Vault 2 are now available from Lenbrook Asia for S$799, S$1,299 and S$1,799 respectively. We’ll be testing the Node 2 and Powernode 2 soon, so stay tuned for our reviews!